Home » Dairy » Top 200 EBI herds details…how do you compare? 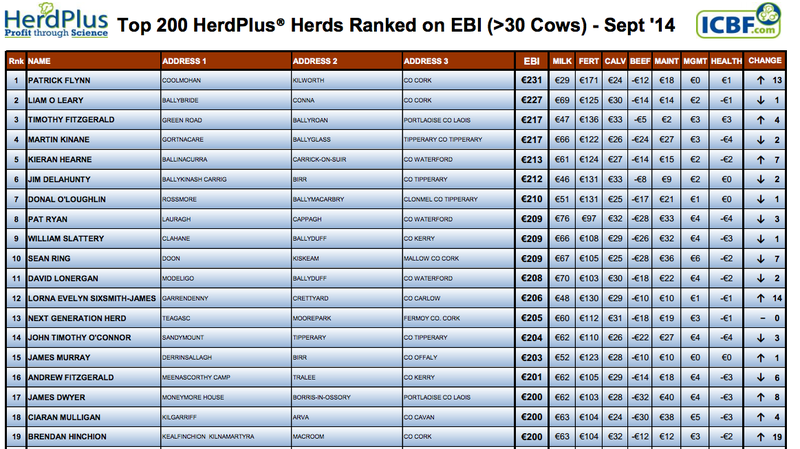 Top 200 EBI herds details…how do you compare? Details of the top 200 EBI herds have been published by the ICBF. Having spent almost three years at the top of the EBI herd listing, Liam O’Leary, Conna, has slipped to second place, having been passed by Patrick Flynn, Kilworth, who jumped 13 places to secure the No.1 spot for the first time. Timothy Fitzgerald, Portlaoise, claims the third position having jumped four places since the last evaluation in May. There are now 20 dairy herds surpassing the €200 mark on EBI and 17 herds are making an appearance on the list for the first time. The Teagasc Next Generation Herd at Moorepark is ranked at No. 13. The average EBI of the Top 200 herds is €187 with €56 coming from Milk and €100 from Fertility. This compares with a national average of €125 (Milk €36, Fertility €74). Six of the top 10 farmers are located in either Tipperary or Cork. The full listing can be found here.